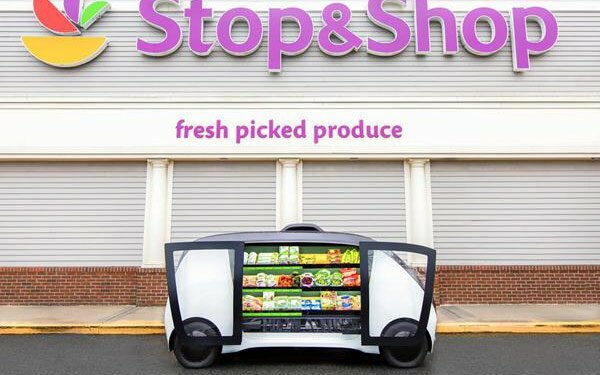 Grocery chain Stop & Shop plans to launch driverless grocery vehicles in the Greater Boston area. The vehicles will contain a selection of Stop & Shop produce, meal kits and convenience items for consumers to shop at their doorsteps, according to the company. The vehicles from Robomart, a San Francisco startup, can be summoned via smartphone app starting in the spring. When the vehicle arrives, customers can unlock the vehicle’s doors to select the fruits, vegetables and other products they want to purchase. When the shopping is done, the shopper closes the doors and the vehicle goes on its way. Technology including RFID and computer vision automatically records what customers select and provides a checkout-free experience, with email receipts.